Tailor made suits are a product that requires multiple fittings, so prices are governed by your fabric choice and garment construction. These include suits, sports coats, trousers, overcoats and more. All Adriano Carbone tailored garments are 100% Handcrafted in house. 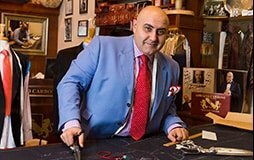 We are happy to offer a consultation in order to determine your specific needs and offer a quote for your tailor made garment. Give us a call today to book your appointment. Our bespoke handmade garments take over 100 hours to handcraft, require 3 to 4 fittings and take 10 weeks to complete. Bespoke suits and other garments are 100% handcrafted in our melbourne sartoria (work rooms) in the block arcade. Pricing varies depending on the type of garment you are looking for, as well as fabric choices, styles and more. Our one on one consultations allow us to gather the information required in order to offer a quote. Give us a call today to book your appointment. All garments are made in our sartoria (working rooms) in the block arcade melbourne.